Moneytis is one of the most successful examples of how startups are changing the financial industry. The startup helps expats move money between countries and currencies by acting as the booking.com of money transfer: the platform searches for the fastest and cheapest money transfer in real time, thereby saving users hundreds of euros. 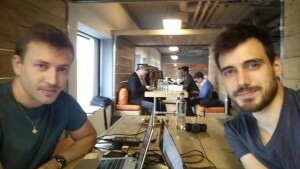 Moneytis is run by an international team that moved to Amsterdam to join the ING innovation studio. We interviewed the co-founder Christophe Lassuyt. When did Moneytis start? How long did it take to build the first product? I started Moneytis in June 2014, together with my co-founder Etienne Tatur. We were both international travellers and occasional expats, and knew first hand how opaque money transfer services work. All services charges user (a lot) of money, but for most services the charges (up to 3 percent) are hidden in the exchange rate. We wanted to make the charges transparent and help people find the best way to exchange money. We teamed up, worked for 9 months on a first MVP and launched this at Moneytis.com. You sometimes describe your company as a booking.com. Do you advice about the right money transfer services only? Actually, we have been experimenting with our own transfer service, using blockchain tokens (Bitcoin) from the beginning. Blockchain makes it possible to transfer money instantly from anywhere. For money transfer it is a very promising technology. We discovered however that we could offer a lot of practical value immediately by comparing existing services. Many of the popular services, such as the UK service Transferwise, have opened up APIs (Application Program Interface). With these APIs, it becomes easy for user to directly make the transfer with the best party. This allows us to offer our users access to many options, including but not limited to blockchain. What is your view on Bitcoin? Bitcoin is only one of the 600+ crypto currencies out there, and currently the most famous and efficient. It however still represents a water drop in the ‘ocean of money’. The blockchain technology behind it provides almost infinite possibilities. Many industries could be disrupted and money transfers could become instant, trackable and (almost) free. You started as a team of two. Did it grow over the past month? Yes, we were able to recruit some additional people: in total there are two engineers, two marketing officers and two financial data analysts. In the last three months you interviewed many customers to see what pains they have. What are the main problems they have with money transfer? How does Moneytis help? Almost all people who transfer money have problems with it: the cost, the easiness, the speed, the transparency or the traceability. We learned that the best rate is not the only an important factor for users, and we are using this knowledge to improve our platform: we want to help each user find the best way to transfer money, not just the cheapest. What is the biggest transaction you have done until now? Are bigger transactions harder for you as a small startup? Big transactions are hard, but people already trust our service. In the remittances market the average amount sent is around 300 euros, whereas we already did transfers worth more than 3000 euros. What is your impression of the Dutch startup ecosystem? What are its strong points and weaknesses? Well, I have to compare with the French one where we come from. The Dutch ecosystem in comparison is growing and open whereas the French one is difficult to access, for esample because of expensive events. It’s one of the reasons why Moneytis is currently in Amsterdam and did not stay in Paris. You presented at Holland Fintech last month. Did this help you? In what way? It was a very interesting event, not only for its content but also because people going there are fintech experts. We made new connections with investors and partners, but also found some smart job applicants. You are also supported by the ING innovation studio. Is this helpful? The innovation studio provides us with mentors, expertise and network but also with trainings and access to bank experts. We already learnt a lot, and we would recommend a corporate incubator like the ING studio for other Fintech startups as a way to get access to more financial industry knowledge. Your team solely consists of expats that came to Amsterdam to work on Moneytis. Was it hard to find accommodation? What tips and tricks do you have for other startup founders coming here? In hindsight, is there anything you would do differently if you could do it again? Non rien de rien, non je ne regrette rien, said Edith Piaf. We have no regrets and keep profiting from life, work and travel. Are you planning to raise funds in 2016? 2016 is going to be intense, because we are going to raise 300,000 euro in coming months and think about raising more at the end of the year.